Awkward Family Photo or Photoshop Disaster? 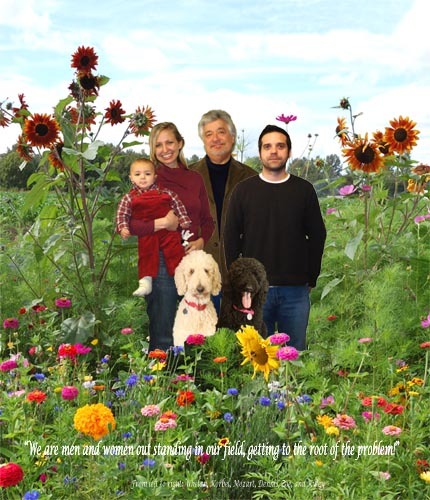 - Seed Snatcher Seed Snatcher: Awkward Family Photo or Photoshop Disaster? Awkward Family Photo or Photoshop Disaster? While wasting my life away on Twitter I came across the Twitter account for The Seed Den, Inc., out of Oregon. At first I didn't think anything of the site because it looks like your basic minimal website that a lot of small garden businesses use. Then I scrolled down to this. My eyes were straining so hard to read the quote on the picture that I didn't notice the Photoshopping. It is like an Awkward Family Photo and a Photoshop Disaster had a baby who grew up to be a gardener. I love it. You can see the original at The Seed Den's website. Wish I'd found them last year when I was looking to buy seeds wholesale for a project I was working on. I would've bought seeds from them for having the seedballs to publish this photo on their website. In case you're curious, the caption reads "We are men and women out standing in our field getting to the root of the problem." LMAO. Win. This summer I want you to come out to my place to visit. We need to take a photo like this in the garden with a bunch of we local bloggers and awkwardly photoshop in weirdness. This is priceless! !